AUGUSTA, Ga. -- Winning the Masters is worth far more than any amount of money you could possibly attain for the victory, but boy, that payout is pretty great, too. The 2019 Masters purse is up to $11.5 million from $11 million a year ago, and the winner will receive over $2 million for the first time in the history of the tournament. 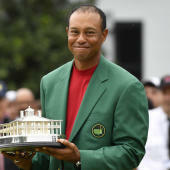 And while you won't get a green jacket, second place isn't that shabby at $1.24 million, which is more than can be earned by the victor of many PGA Tour events in a given season. The purse is so big, in fact, that this year's third-place finisher will receive as much as the entire field did when Jack Nicklaus won the 1986 Masters. So while one of the last thing a green jacket-earner will be thinking about come Sunday evening (or Monday morning) is how much money will hit his bank account next week, it's still pretty great work ... if you can get it. We are at a blistering pace rolling to a finish at Augusta National, and it is still up in the air who will claim the grand prize. Here's a look at all the prize money and payouts for the 83rd Masters. The following are the payouts for the remaining places. When golfers tie for a position, their share of the purse is an average of what those competitors would be paid if they were positioned in order. The remainder of the professionals will receive cash prizes ranging downward from $28,290 depending on their scores and finishes among the field.